Recycling is now mandatory in Alameda County. Click here for details. Please take advantage of available programs for Recyclables and Organics. Doing so is great for the environment, good for business, and can help keep your monthly waste collection costs down. For program tips and details, review the Commercial Recycling Guide, posters, videos, newsletters and bill inserts posted on Publications & Resources page. 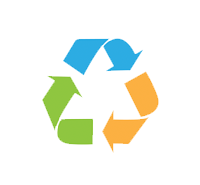 Upon request, Livermore Sanitation will conduct a recycling opportunity assessment, provide free training assistance, and distribute helpful collection container signage– all for no charge. Contact us to add/change service, request signage, schedule a recycling opportunity assessment, or set up a training. What belongs in each of your carts/bins? Click on each cart for a list of materials that belong inside. Click here for a short video on our commercial organics program. Click here to see our commercial organics poster. Commercial garbage service subscribers receive 96-gallons of recyclables and 96-gallons of organics service once per week for no charge. Service subscribers requiring recyclables and/or organics service above that threshold are charged at the rates listed below. Adequate garbage service is required. Less than 96-gallons of recyclables and/or organics service may be requested but the monthly garbage rate will not be discounted.